Life is demanding for a "Warrior Woman" in the modern world. Iron is vital for health, it's the most common nutritional deficiency in the world. As many as 20% of women have low levels. It also affects some men. But for women, the menstrual cycle and pregnancy can make this more of an issue. And in fit female athletes, special care should be taken to ensure iron levels are good. This is thought to be due to the higher turnover of red cells combined with menstrual flow. Bumps and indentations in nails, and a flat spoon like appearance to them. The first step if you think this may be an issue (or any situation where you are suffering symptoms) is a blood test from your GP. In some cases the initial test may be ok (CBC blood count which checks the levels of red blood cells), but there is a second test relating to the ability to store iron which looks at ferritin levels. It depends on the GP, but it may be wise to request both just in case. B12 and folate can sometimes be an underlying cause for low iron, so this may be included in the blood test, or added late. Do note even if your tests come back clear, there may be slightly low levels of iron causing you some issues, so adjust your diet accordingly if you think this may be the case. In the vast majority of cases, this is related to diet and / or for women the surrounding issues regarding their cycle and childbearing. There are some health issues and medications that can cause anaemia. And other easily identifiable causes such as giving blood, or recent stomach viruses. If there are underlying health issues, then your GP will guide you. For dietary issues, then this is relatively easy to resolve. Depending on severity, take these steps, and you can feel changes in a few days, but can take 2 - 3 months to really get everything back to normal in severe cases. It is one of those wonderful opportunities to take stock in life, and make some positive changes. Fantastic food is always first when any sort of healing is required. It may require some changes to your dietary patterns. Here are the top foods, with an additional note for vegetarians below. A note on eggs - they have fairly decent iron levels, but also contain phosphorprotein which inhibits the the iron, so add them certainly, but vitamin c really helps here (see below). A can of Guinness is a nice traditional drink with some iron if you fancy an occasional tipple during your restoration process. Finally, we highly recommend some organic, unsulphured, blackstrap molasses from your health food store (other types of molasses are not suitable). Twice a day, enjoy two teaspoons in hot water. This traditional remedy gets highly bioavailable minerals to your system and is incredibly healing. Don't worry about the sugar, the glycaemic index is actually quite low. It's not something we recommend all the time, but such a fabulous natural food to include for iron deficiency. In general however it's a good substitute for refined sugar for occasional homemade treats and cakes. And for anyone under the weather, a useful short term remedy. For us, we cannot endorse all the iron fortified junk breakfast foods, as much as you may see them on official government guidelines. The influence of the big companies such as Kellogs and Nestle on Government policy making is a disgrace. We look at this serious issue in We'll Have an Egg for Breakfast Please. To maximise your iron rich foods, add vitamin C with each meal, in effect the leafy veg will do this alongside your red meat. But you can add some natural vitamin C in supplement form too with the Acerola. Avoid tea and coffee with your meals as this will reduce absorption of the iron, as will red wine. And to some extent dairy products can interfere with the uptake of the iron. A vegetarian or vegan diet can in some cases in itself lead to an iron deficiency, and can be tricky. The non-haem form of iron in vegetables is not quite as easy to absorb. So it is vital to focus on the right types of foods. There are also some supplements that can be very advisable to use which we look at in more detail below as these of course apply to anyone once a deficiency has occurred. 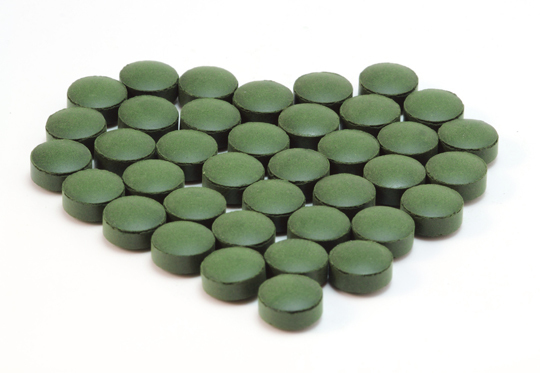 Chlorella is a simple solution - 15 tablets per day will give you are 6mg of iron around 40% of your RDA. And it is a key benefit of this supplement. It is also a good plant source of B12, so this is our top recommendation for anyone with anaemia, especially vegans and vegetarians as a supportive supplement to make your lifestyle work.It's an incredible supplement, a totally natural multivitamin and mineral and so much more. A second option is Barley Grass Juice Powder, a little less iron, around 3mg on a typical daily amount, but still a VERY good support. You might also take a look at Floradix which you can grab from your health food store. Whilst we prefer foods and food state supplements in general, if you have a real deficiency, you need to take action, and a couple of months of Floradix will really help matters. This really is very natural, and quite a lovely and effective supplement. The mainstream iron supplements recommend by your GP may be required in some serious cases, but for most people, most of the time, natural is best. The presribed iron can be trickly for some to tolerate and cause constipation. But there is a role when needs must, as there is for (IV) iron therapy. In general these options are more for where there is an underlying condition causing the deficiency. Your GP will guide you here. If the B12 is the reason your iron is out of line, the Chlorella will help with this, but we also have an incredible natural B Complex the Zell Oxygen worth adding if the Bs are the issue. For adults the EU RDA is 16mg day, this is believed to cover 95% of the typical population and allows for some changes pre and post menopause for example. But in practice, post menopause ladies need a little less. How Easy is it to Get Enough Iron? Some people may find they are quite short when they look at their diet. Let's say 4mg in a good steak, 2-3mg if you eat a LOT of leafy greens, 1mg or so from your morning porridge, 1mg from nuts and some fruit, add for example 6mg from your Chlorella, and that just about gets you to the recommended daily amount. So it is easy to see how women especially can become depleted, especially over time, and when not eating fantastic foods. Add some heavy periods, or illness, and deficiency even if mild can occur. So, you see, we MUST be iron women and ensure that our diet meets the needs of being a warrior woman in this demanding times! As always, any help needed, call, email, use the live help desk, we are here for you.